This is a review of finch thistle bird feeder. Im going to talk about this unique smaller size bird feeder that is geting more and more popular with the bird lovers. This little Finch Bird Feeder is made by Woodlink for thistle bird seed and is designed to attract thistle eating birds like Goldfinches. It's very well made and sturdy, the steel construction and mesh look well designed and looks like it will last. The bird feeder comes with a durable powder-coated finish. This feeder come in a smaller category of bird feeders, and will accommodate 3-4 birds at one time. Feeder capacity is around 3/4 pounds of thistle seed. Design comes with a drain holes in the bottom for water to flow out in rain. This will keep the seed dry, but if heavy rain falls the seed will get damp and will need replacement. The top comes off without problem and is easy to fill. This product looks like its well made, it's just a little smaller size than what I was expecting. It looks like the measurement on this one is actually from the base when you look at the specifications. But the quality of the feeder is better than expected, considering the very low price. When placed properly the bird feeder is sturdy and functional. 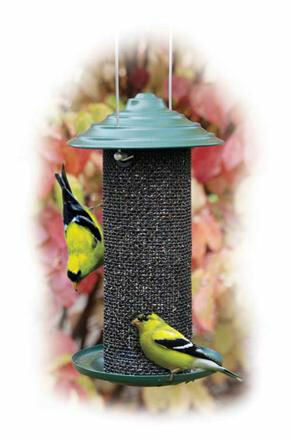 Some bird feeders on the market have mesh that feature a too wide gauge and this allow the seed to spill out. But this WoodLink product looks like they did it right. When placed outside very little seed will escape unless eaten out by wild birds. The top looks well designed and travels well for easy reloading yet sits securely when pulled down after cleaning. I can say that it is s well designed, well priced feeder. If you don’t mind a smaller size. This finch bird feeder looks like it will held up well in harsh weather and elements, it will not rust, and will do good in windy area. All type of finches will be attracted to this feeder, and it's easy to hang. It usually takes the finches that come to eat a few days to find the feeder, sometime you can see them on the first day. What I like about this Woodlink MINIMAG2 "Mini" Magnum Finch Bird Feeder that the medium-mesh screen is sturdy and will outwear the sock type feeders that are out there on the market. The screen design is made in the way that it is a good perching medium for goldfinches, and although nyjer seed will leak a little from time to time from the holes, this size of the mesh will give access for even short beaked songbirds to eat. All in all, it looks it is well designed and executed, a definite plus to the Woodlink, seed will be fresh and not damp. This bird feeder is small, but his size can work to its advantage from some larger ones out there. As the seed is not staying in the reservoir to long, there is a lower chance of it getting spoiled. This feeder is perfect for cleaning, easy to open and refill, not to big, the metal lid on the bottom will catch the seed from falling to the ground, and the birds will eat it from there. The finches are usually spoiled and do not like stale seed and it is also dangerous for them, so this little bird feeder is just the right size. In case of rain You will however need to check the seed and keep the tray clean as seed gets wet and molds in heavy rain frequently. Check it daily if it is raining or snowing. But it is well made, not complicated to disassemble and clean. Holds just the right quantity of Nyjer seed so the birds eat it and it doesn't go bad. In this way it is a great money saver, and protects the health of your visitors. The lid lifts up for filling and we haven't had any problems with it getting knocked around, even by the bluejays. The seeds spill into the bottom tray and the sparrows eat from there, often two at a time on the feeder. The chickadees eat from the column of the feeder, though. And the one finch we've seen did too. The bigger birds like blue jays or starlings did not damage the feeder when jumping on it. If bigger birds do knock the feeder around some seed will spill out, but the birds will quickly eat it. Chickadees will come to on the feeder and some sparrows to eat from the bottom tray. Where to place The Finch bird feeders? The Finch Bird Feeder come with a metal hanger, and is easy to place. It is recommended that you place it under a tree branch or a roof if it’s a rainy season. The bird feeder is equipped with a roof and drain holes but seed will get wet in the right conditions. If its summer and warm it can be places in the open, and the birds will come to it. Keep in mind that only dry seed will attract the birds. The birds will take days to find the feeder, sometimes weeks, on the other hand you can see them feeding the same day. You must give them time to find the bird feeder. Make sure it is placed at the right height from the ground, at least 6 feet off the ground. Birds like to have some cover when feeding, place the feeder next to a tree or bush so birds feel safe to run for cover if predators are near. The feeder is made of metal and squirrels cannot do harm by chewing on it, but they can damage it if its knocked down multiple times. Secure it so that it is not easily reached by them, and don’t hang it with a rope that can be chewed on by squirrels. Squirrels don’t like nyjer seed, but when they see the birds it looks to them like something to check out, after some time squirrels will not come back and your good to go. If you didn’t get all of this contact customer service to replace the missing parts. What type of birds this Best Finch Bird Feeder attract ? Goldfinches, house, purple, and Cassin's finches, pine siskins, and redpolls, song sparrow, Dark eyed junco, etc. These kind of birds love nyjer seed and will come back every day to feed from this kind of feeder. These little birds have small pointed bills, and have no problem in eating small seeds like thistle. These birds also love to cling on the sides of the bird feeder, you can see them sometime upside down while they eat. Finches will specially come to nyjer or thistle bird feeders, goldfinch, house finch etc. Finches like to stay and feed in flock, so if you see one on your bird feeder, chances are he is bringing friends! You can see up to 15 finches on one bird feeder, it is a colorful site. House finch for example benefits from human development, and likes to build nests on houses or small cavities in buildings. So thistle feeder will attract this bird to your yard. Goldfinch also likes to feed on sunflower and nyjer seed. They will come to bird feeder year-round but specially you can see them at winter times. As all finches you can see them in large numbers flying around bird feeders. Nyjer seed comes originally from Nigeria, that is how it got its name. In bird feeder world it is also called thistle but that is not correct. Nyjer is oil type of seed, and it is popular in bird feeders because it I a high energy source for the birds, and it will not sprout if it falls on the ground after it is sterilized. Because of this high nutrition value it is a good winter bird food, and can be offered at bird feeders as supplement for wild birds. In winter birds require food with more oil and calories to combat the wind and low temperatures. As mentioned before finches like Nyjer seed and will gladly come to feed on it. By understanding the importance of this seed, it is easy to install a Nyjer bird feeder in the backyard. This seed can be expensive in small quantities, so it is best purchased in larger bags. This is cost effective if you feed birds year-round, and will result in smaller price per pound. How to know if the seed have gone bad? In case of heavy rain some water can come inside small holes that allow seed to exit. If moisture builds up inside the birds will not eat from the feeder as finches specially don’t like wet seed. If the finches are coming to your bird feeder and suddenly stop visiting, it is a sign that bird seed must have gone bad or wet. If that is the case birds will avoid this feeder and stop feeding. You will see the bird and hop to a perch to feed, then hope to the next perch and take a peck, stop eating and hop to the third perch and maybe take one more peck, then fly away altogether from the feeder. That is a sure sign the seed is bad, maybe wet or to old. Change it and clean the feeder at that point. Finches are seed eaters, insects are not common food for this birds, so placing a nyjer feeder in your yard will help this birds to find food in winter, but also in time of nesting and raising young birds. It is good to place a water source next to the bird feeder, so wild birds can use it as this is important to them all year-round. I think this is a good choice for the bird lovers that want a lower priced but still good quality bird feeder, and Minimag2 "Mini" comes in that range. This is one of the best finch feeder out there. Well made, sturdy, and not expensive, even if smaller capacity, it gives a lot for the price. Check Woodlink MINIMAG2 "Mini" Magnum Thistle Feeder here.